Today’s post is a real treat. I reached out to David Gans to see if he would be willing to write a guest post and to my surprise he agreed! For those that don’t know, David Gans is a first rate musician in his own right (you can check out his recorded work here and his schedule of gigs here. He is also a Grateful Dead writer and producer (notably the So Many Roads box set). 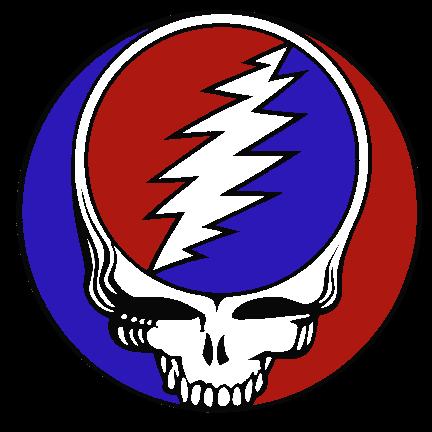 He hosts the nationally syndicated Grateful Dead Hour and co-hosts Tales From The Golden Road on the Grateful Dead Sirius XM channel every Sunday (4pm Eastern). Without further ado, here is Mr. Gans’ superb analysis of the Truckin’ > Mind Left Body > Not Fade Away > Goin’ Down The Road Feeling Bad > One More Saturday Night sequence that closes the second set of this epic show. May 19, 1974, Portland OR: The jam out of Truckin’ includes the classic descending-triplet trope the band employed pretty consistently in this era; Phil Lesh does especially wonderful things all around the main figure, which Jerry, Bob, and Keith are concentrating on. They all hit the climax together, and then the ensemble settles down a bit and feints in the direction of “Nobody’s Fault But Mine,” which occurred fairly often in ’74 and even included the vocal (by Jerry) from time to time. At about nine minutes (from the start of “Truckin'”), Garcia picks up the feel by playing more rapid-fire notes with some pitch-bending, and Kreutzmann responds with a thickening of his groove. Without increasing the tempo, the entire band starts playing busier (in a good way!) parts, all working together to make something wholly new. At around the 11-minute mark, the ensemble begins emphasizing a beat together every other bar or so – but that only persist for a moment or two; this is is a terrific example of the collective exploration we love so much, with everyone responding to everything and a genuine gestalt creation emerging. At approximately 11:20, Phil plays a C note that introduces a new idea to the jam, vaguely suggestive of a song that didn’t yet exist: “The Music Never Stopped.” But again, this is transitory; the energy remains high and the groove continues to evolve. In the 14th minute, the notes thin out a bit without diminishing the energy, and in the 15th minute Kreutzmann starts playing more of a backbeat and the possibility of a new groove begins to develop. Jerry plays a few bars of high stabbing chords, then lays out just a bit before returning with a series of syncopated chords, played high up on the fretboard. At 15:30, the groove opens up a bit, and two things happen at once: Phil begins playing a “Not Fade Away”-ish line, and Bob trills on a pair of notes that describe the top chord of his descending pattern the “Mind Left Body jam.” Both Weir and Lesh stick to their guns for a couple of bars; at around 15:40, Bob initiates the descending chord structure. Jerry switches to an overdrive sound that he used quite a bit in this period, affirming Bob’s command of the moment. Kreutzmann and Lesh take a very brief rest, then Kreutzmann resumes with an energetic pattern and Phil plays a series of whole notes, underpinning the interaction of Bob, Jerry, and Keith, and then lays out altogether for a little while, during which time Keith Godchaux takes over with his electric piano. Jerry plays some shorter phrases with a wah-wah. At this point, there is a lot of space in the jam, as everyone is doing more episodic stuff while a new direction is sought. Finally, at around 18:55, Jerry rakes a wah-wah E chord and the whole band steps together into “Not Fade Away.” The recording has plenty of Keith’s piano in the right channel and Jerry on the left, and you get a great feel for how all these players are listening to one another and working to make something greater than the sum of its parts. Tagged 1970s, 1974, David Gans, Portland OR, Wall of Sound. Bookmark the permalink. He plays a mean guitar, too. If you ever get a chance to see him live, do it, or you will never forgive yourself. Indeed! The now defunct Sycamore Slough String Band comes to mind as quite good. I thought he was working on a Dark Star-centric book, but I have no idea the status of it. Needless to say, I hope it comes out sooner rather than later. Wow! This is fantastic! Not only do we get to hear from David Gans (is there a deadhead alive who doesn’t like David Gans?) but he also chooses to write about a terrific show. 5-19-74 has long been on my imaginary top ten shows list (a list almost impossible to compile). In addition to the great sequence David mentions, I really like the Promised>Bertha>GSET combo that was played occasionally in 73/74. Hopefully we’ll see this show released soon. Lunchbox picked the Dark Star from the Montana show not too long ago and it’s interesting how two shows so close together in time are so different. Maybe some of you have a different take on it but I think of the Montana show as a deep space show, particularly the Dark Star and Playin’; it’s not the kind of show you’d play to introduce a friend to the Grateful Dead. 5-19-74 on the other hand is more of a rocker IMO. Sure there is still some space, as in any show from this era, just not to the same level as the Montana show. But both are great shows.